In the early days of music recording, producers would find the best sounding halls for bands to play in to get the most interesting acoustics on the record. But then the budgets for hiring interesting venues disappeared. Instead vocalists were put in acoustically 'dry' spaces in the studio that had no character. That led to attempts to add character to recordings using 'artificial reverb'. Early reverb systems used metal plates or springs to emulate the sound of multiple echoes from walls. These didn't give the fine control needed to copy the sound of a particular room though so 'digital reverb' was born. Digital reverb involves creating those interesting acoustics on a computer and applying them to the recording afterwards. Building a reverb that sounds exactly like a real room is very difficult so it's taken some clever engineering to design a way to capture a room's sound. The first step is simple. You just play a known sound through a speaker in the room and record it. The sound used is usually what is called a 'swept sine wave' - a sound wave that goes from the lowest rumbling frequencies up to the high frequencies only dogs can hear. That kind of sound is easy to identify so we can take it away from what ended up being recorded to obtain a sort of acoustical fingerprint of the room - technically it's called the 'room impulse response'. Doing this slowly isn't too difficult, but some complicated mathematical trickery is used to do it as the recording is happening without a noticeable delay. This process of removing the sweeping sine wave, known as 'deconvolution', is a neat trick. It means we can then add ('convolution') any dry audio recording to the fingerprint of any room even if the room is on the other side of the world. Our up and coming vocalist's new album can sound as if it was recorded in any room we like even though she stays in that boringly dry studio. This basic idea has also been used by researchers at the Helsinki University of Technology to create a 'Rehearsal Hall with Virtual Acoustic for Symphony Orchestras': a system for musicians to do real-time performance and practising. It can sound as if it was recorded in any room we like. On the other side of the Atlantic, researchers at McGill University in Canada have used the same approach with a different purpose. They've created a system for measuring the musicality of musicians as they rehearse. First the room where the musicians will play is acoustically treated so that it doesn't have any big echoes or sound character of its own anymore. Then, lots of loudspeakers are set up around the musicians. Each instrument or instrument group has a microphone and its sound is combined with the acoustics of a different room. That combined sound is fed back to the individual musician through the loudspeakers. The overall effect is that each musician can play listening to the acoustics from their favourite venue. Experiments have shown that this improves musicality in rehearsals, and a happy musician leads to a more exciting performance. The technology can also be used to pre-practice as if in a venue where you are going to perform, help composers understand what their piece will sound like at its premier and let orchestras choose a different venue for each piece. 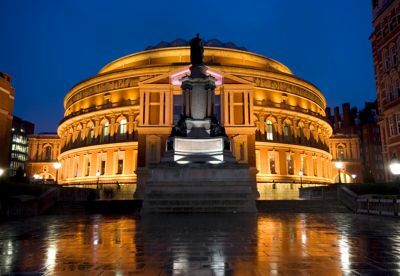 Have you ever wondered what your voice would sound like in the Royal Albert Hall? Install the technology at home and that is where you could practice your singing from the comfort of your bedroom.